I'm sitting at my desk, staring out the window at snow wafting through the air. Again. It's 22 degrees but feels like 11. Really, it could be worse. I could live in the Dakotas or Canada or somewhere even colder and snowier. As pretty as the snow looks as it gently falls to the ground, I can't help but think,"NOOOOOO no more, please!" As usual these days, my hands are cold. I need to make a nice, hot cup of cappuccino or a nice hot mug of cinnamon tea to wrap my cold fingers around. Maybe both - I have a mug warmer to keep one warm! A biscotti would make that hot beverage even more comforting. 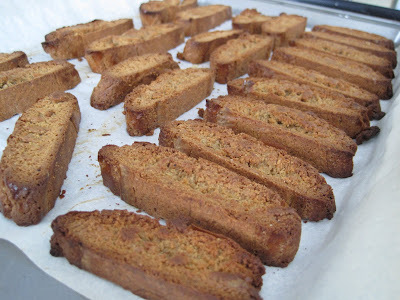 Fortunately, yesterday afternoon we made biscotti - Cappuccino Biscotti from Sweet Maria's Italian Cookie Tray - A Cookbook. 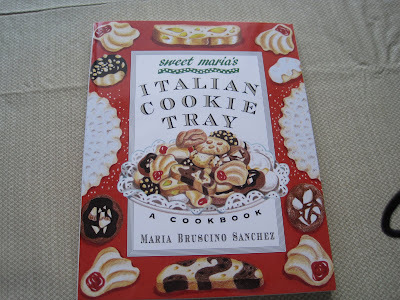 Like the puff pastry cookbook and the Cook's Illustrated cookbook, this Italian cookie cookbook was a Christmas present. 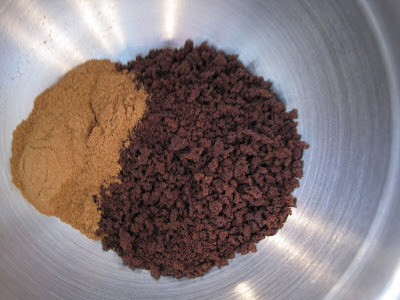 I love the flavors of coffee and cinnamon. These Cappuccino Biscotti are similar to the Cappuccino Pizzelles we made in that the recipe calls for coffee liquor, cinnamon, and espresso powder. The dough smelled so gosh darn good. I couldn't stop inhaling the smell! I stuck my face up close to the bowl and inhaled over & over. That sounds bad, but really, it was like aromatherapy. My lavender eye pillow smells so calming and soothing when I put it over my eyes. 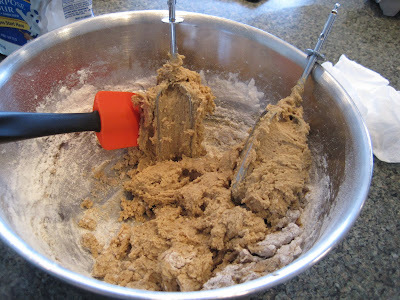 The cookie dough was the same - the smell made me happy and relaxed me. The dough was a bit difficult to work with. SP kept trying to shape it into logs, but every time he'd pick up a log to transfer it to the cookie sheet, it would start to stretch out of shape. He got a bit annoyed. I just kept inhaling the smell and smiling and offering helpful words of encouragement like,"Look out - the dough is drooping on the right side." In the end he was successful! As these baked, the house started to smell so welcoming and comforting. We took the logs out after about 22 minutes and let them cool. When we sliced them, we discovered that they were still a bit uncooked in the center - much like when we made the Almond Citrus Biscotti. 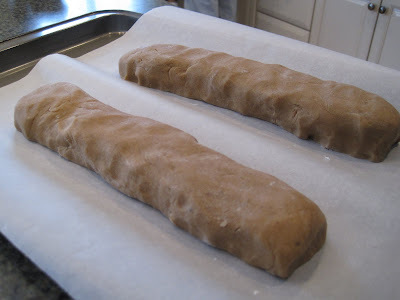 In the future, we plan to let our biscotti bake for a bit longer than we think necessary to ensure that the insides are cooked. 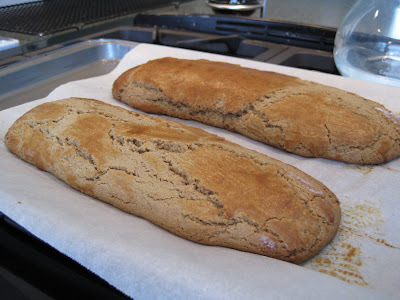 Unfortunately, I think we crisped the cut biscotti for a bit too long in the oven. Some of the edges are a bit burnt. 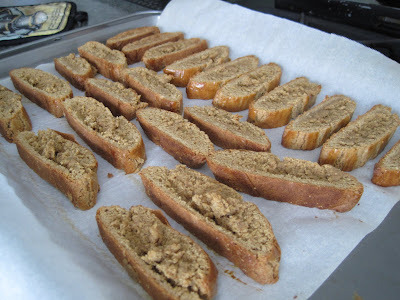 They're a bit hard - and yes, I realize biscotti are a hard, crunchy cookie, but I definitely need to dip mine in tea or coffee and let the liquid soften the cookie before I can eat it. SP must have super hard and super strong teeth - he can crunch his way through undipped biscotti!!! 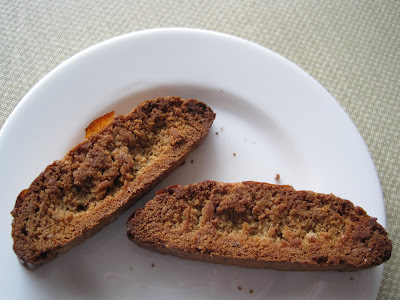 While the sliced biscotti crisped in the oven, we snacked on biscotti crumbs (slicing the logs usually yields lots of tasty crumbs). When we took the crisped cookies out of the oven, it was time to start the moussaka for dinner, so we set the biscotti aside to cool. We didn't eat any until after dinner with our evening tea. Oh my gosh. Delicious. 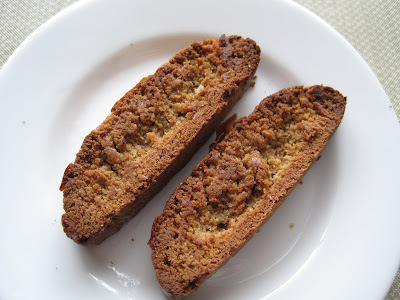 We will definitely be making these biscotti again! A wonderfully tasty treat to dip into a hot drink on these cold January afternoons and evenings.